Some of the most important decisions are made within government facilities. That facilitates a need for rigorous security protocols. Some of the most important decisions in the world are made within the halls of government facilities. Government bodies offer their citizens essential services and policies that guide the everyday lives of just about everyone so security becomes a critical element for the facilities used. There are a huge number of threats that government facilities must combat so it’s important to cover every aspect of security completely and comprehensively. Access control systems are security systems used to regulate who can enter certain areas of a building. 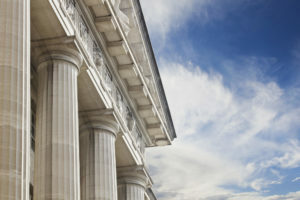 In the government sector, clearance is everything—and access control systems are the ideal way to prevent those without the proper credentials from entering certain areas. These systems have a huge range in what they can do, from biometric systems that are capable of reading fingerprints to CCTV-based video badging systems that use ID cards to verify identity. Parking areas for government buildings are some of the areas most susceptible to wrongdoing. Inspecting vehicles accurately, and looking for the right information, is a necessity if you’re dealing with potential vehicular threats or unwanted intruders. Our Intelligent Vehicle Undercarriage Scanner (IVUS) is capable of inspecting under vehicles intelligently to determine if any risks are beneath a vehicle. The IVUS can be combined with an Intelligent License Plate Recognition system, the ILPR, to track license plates and help verify identity, very much like an indoor access control system would do. Having personnel trained in security protocols is a necessity. Every staff member should be aware of emergency exits as well as who to talk to in the event of a security concern. Additionally, building design itself can contribute to quality security. Having areas clearly indicate who has access to each area is a great way of preventing any confusion on the part of guests and visitors. This entry was posted on Friday, March 16th, 2018 at 1:16 pm. Both comments and pings are currently closed.